Another day, another recipe inspired by a Bon Appetit original. You see, lately, I’ve been looking into culinary schools. Sure, I can cook, but I can’t cook like Mario Batali or Thomas Keller. I’m a self-taught, home cook and I’m proud of that. 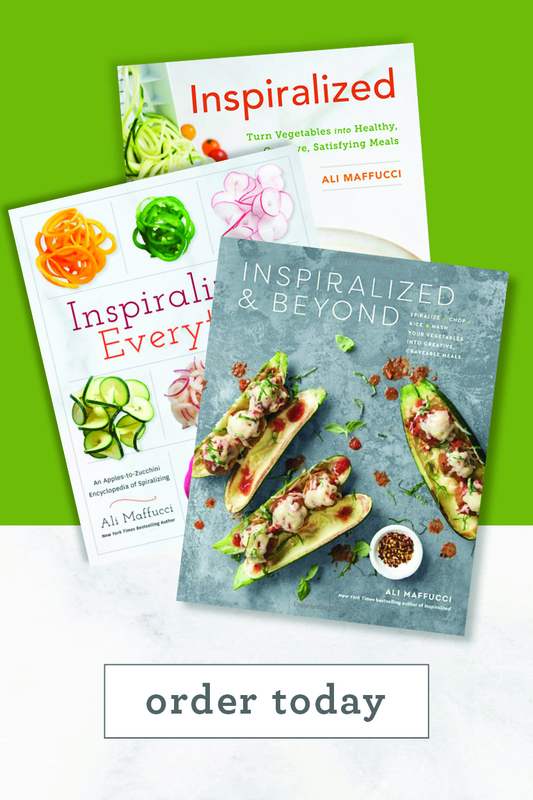 So while looking into culinary schools, I got sidetracked and thought to myself, “Why can’t I just read a book on all this?” This lead to hours of Google searching for the best resources for aspiring chefs and home cooks on, well, how to cook. 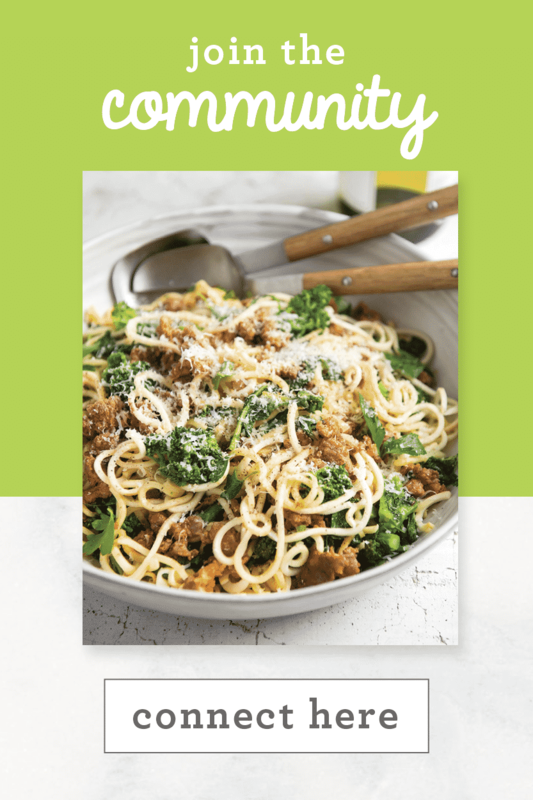 I’m starting with The America’s Test Kitchen’s Cooking School cookbook which literally says on the cover, “Everything you need to know to become a great cook.” Heck, sounds perfect to me! You know, I want to know the science behind cooking methods and proper ways of preparing and cooking meats. I also miss learning, as nerdy as that sounds. So, if the recipes on this blog get fancy, you know why – I’m trying to show off my new skills! No, but really, in my search for these cooking resources, I somehow stumbled upon this Bon Appetit recipe for chicken paillards and asian pear salad. I haven’t yet made a paillard on this blog and it just so happens that pears are spiralizable and I haven’t spiralized Asian pears yet on the blog! Hence, today’s recipe. 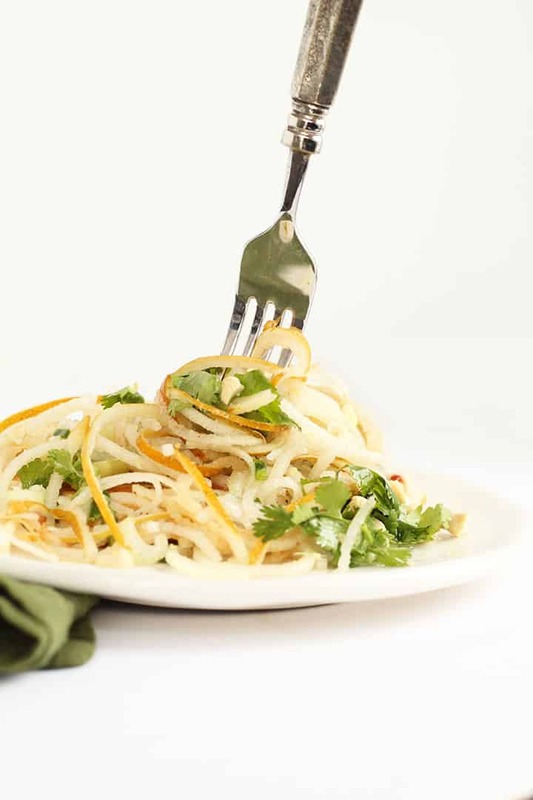 I amped up the volume a bit with this recipe with the pear noodles, obviously, but also with the cashews and a few extra flavors, such as jalapeno and ginger. 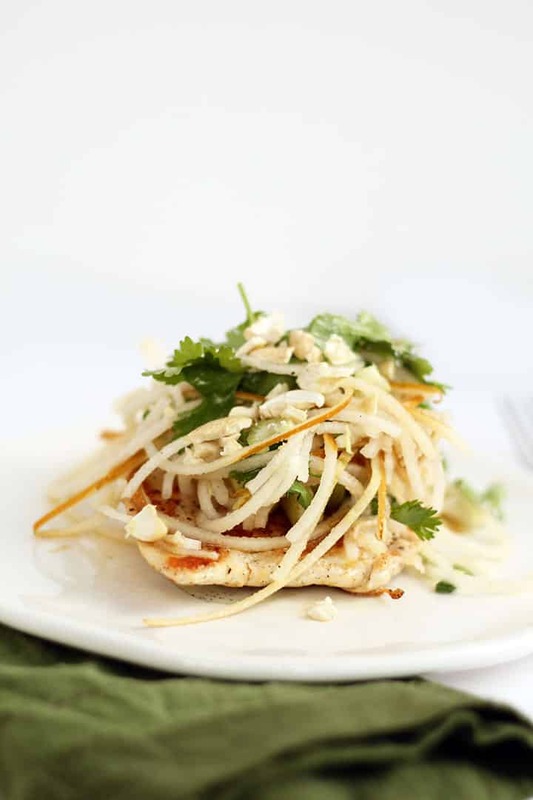 The warmth of the savory chicken paillard (which just is a pounded-thin chicken breast, basically) combined with the tart sweetness of the Asian pear salad is otherwordly. This is such an easy meal (it comes together before you know it) that looks gorgeous, perfect for entertaining friends. Place all of the ingredients for the dressing in a bowl and toss to combine. Set aside. Season both sides of the chicken breasts with salt and pepper. Place a large skillet over medium heat and add in half of the olive oil. Once oil heats, add in one of the chicken breasts and cook for 2-3 minutes, flip over and cook another 2-3 minutes or until chicken breast is cooked through and no longer pink. Repeat with the remaining olive oil and the other chicken breast. 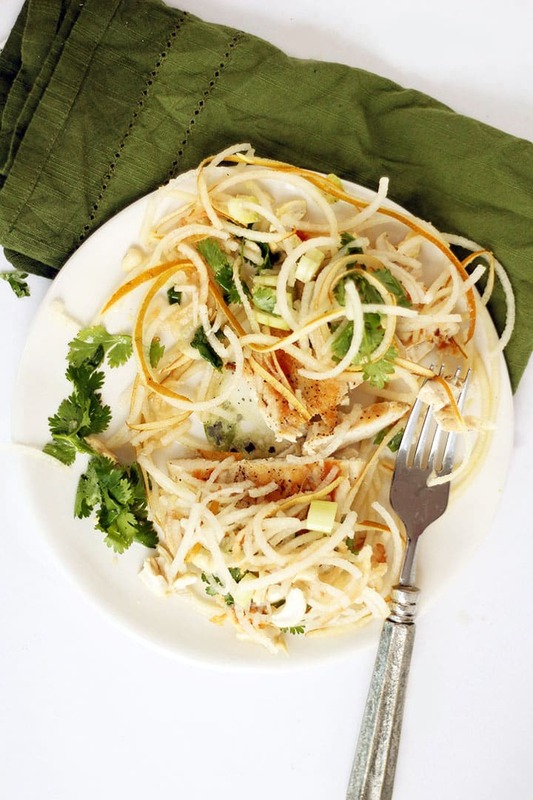 Once chicken is done, spiralize the pear, using Blade C and place in a bowl with the celery and cilantro. Pour over the dressing and toss to combine. Assemble the plates. 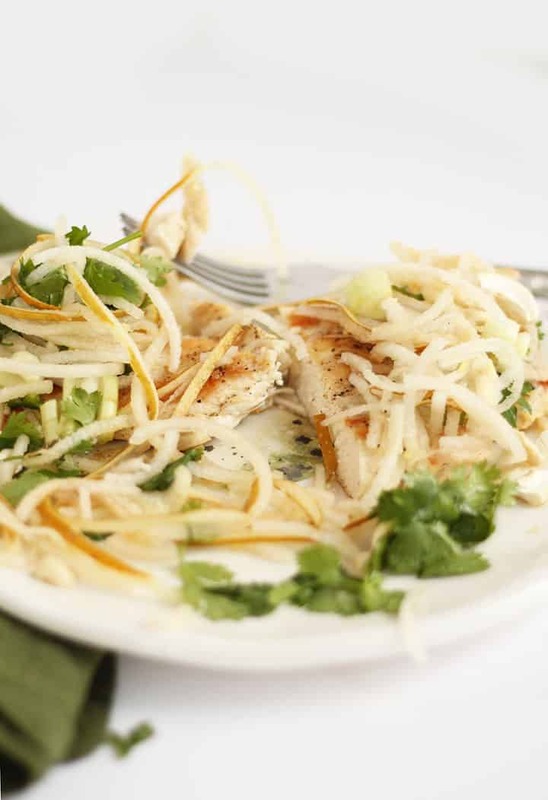 Place a chicken breast in the middle of the plate and then top with pear salad. Top with cashews. Have you looked into the Rouxbe online videos? Thy are pretty informative. I will now! Thanks, Robi! I've spiraled asian pears before and it is as if they were grown to be spiralized! Love them in salads. should I worry about the seeds/core in the pears? Nope, they come right out as you spiralize them! Look into the online cooking school Rouxbe and the plant based course they offer. FANTASTIC! I think you are brilliant. 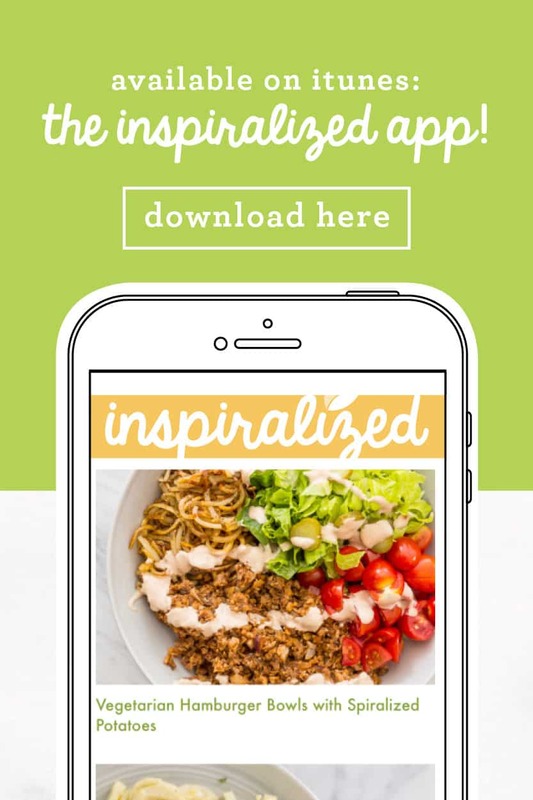 I have the Inspiralized App and am amazed at how quickly I can reproduce one of your recipes. 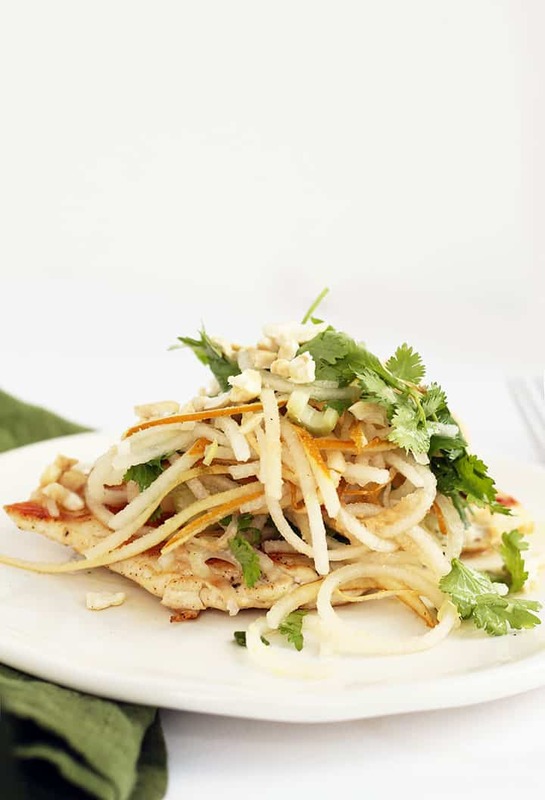 I constantly brag about your fabulous Pad Thai recipe. I am now going to have to shout from the roof tops about the Butternut Squash, Sausage, Kale Lasagna. Your recipes are full of interesting textures and a marriage of incredible spices. Love it! Barbara - you made my day!! Thank you so much for the kind words. This sounds wonderful, minus the celery. I'd have to find a substitute for that. Gaining new skills is great, but you don't have to cook like anyone other than yourself. (Truth be told, Mario Batali does not impress me in a positive way.) You do a great job with your recipes. I found a book that you might like: Cook's Illustrated "The Science of Good Cooking". I figure it's never too late to learn that kind of stuff. Thanks so much for the kind words - and the suggestion, I'll have to check that out! If you like America's test kitchen they have a ton of online courses (I'm just starting) that are really great! Hi Ali, I too am Ally, living in the Cotswolds near Oxford in England. 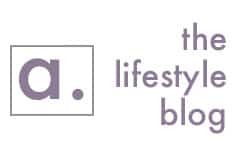 I love your blog and I'm trying out lots of recipes and recommending you to lots of friends! I was trying to see if I could download your app but haven't succeeded. Do you think this will be possible in UK?!?! If you want to learn more of the science behind cooking, you should check out Shirley O. Corriher's book Cook Wise. I have also taught myself to cook and in addition to anything by America's Test Kitchen (they are all amazing), the CIA Professional Chef cookbook and Shirley's books are my favorites! Made this tonight! It was great! I deconstructed it for my picky kids--they loved the spiraled pear and some celery sticks with peanut butter and the chicken by itself. I was worried that it wouldn't be enough for dinner but everyone seemed satisfied! Thanks for the recipes. 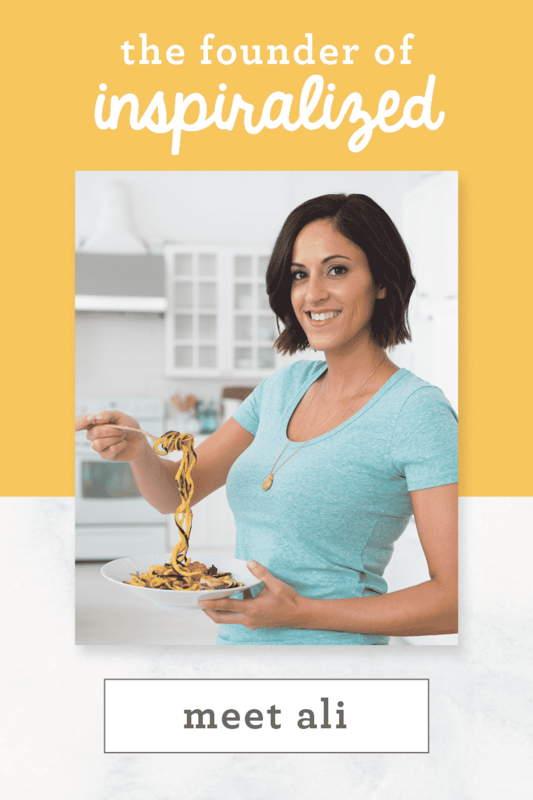 I've really enjoyed my spiralizer and all your posts--this was the first of 3 recipes I'm planning to make from your site this week! How fun! 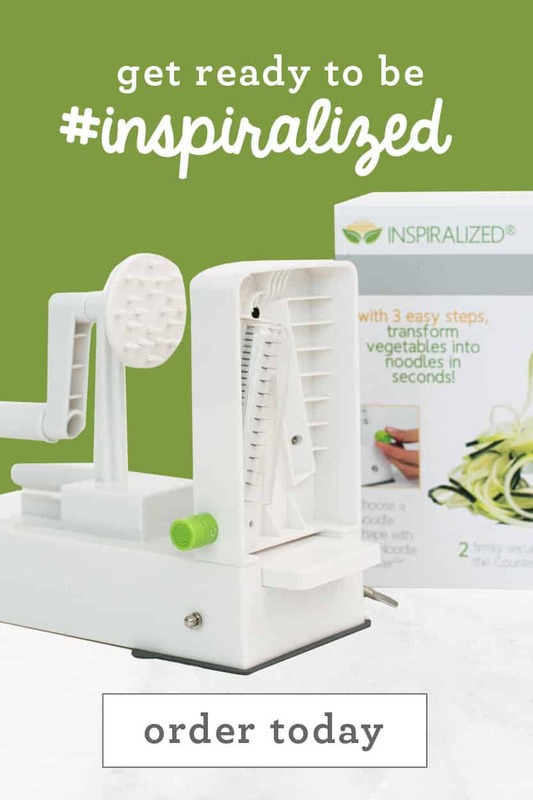 I'm glad your family is becoming Inspiralized!! I'm a product of the French Culinary Institute. Already 10 years have passed since I graduated and eventually I didn't pursue a culinary career but it was one the BEST years of my life. 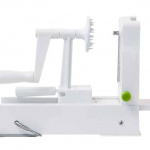 It changed my way of cooking forever. Now it's much fancier and much more expensive! Made for dinner this evening and thoroughly enjoyed - thank you! I used a whole mild red chilli finely chopped instead of jalapeño and the colour contrast was very pretty! Check out "On Food and Cooking" by Howard McGee if you want to learn more about the science behind cooking. 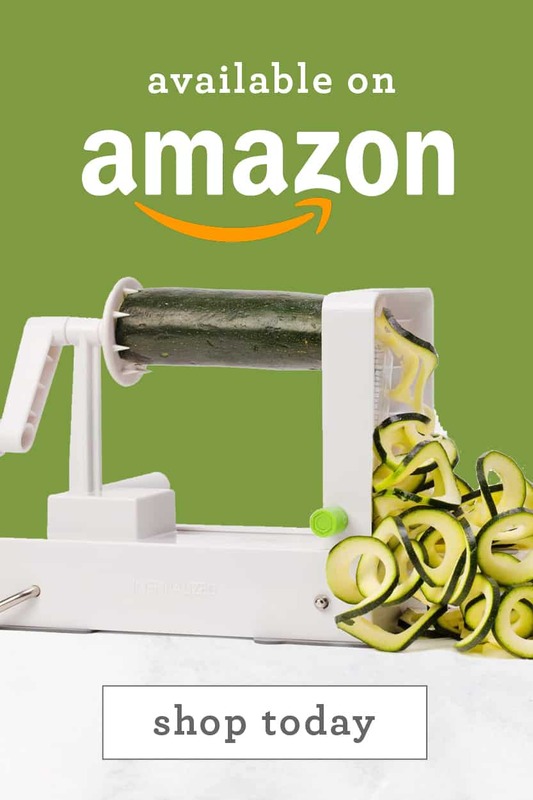 It's my go-to gift for anyone that loves to cook.